If you want early access to the next version of Android Studio, you don't have to replace your existing stable version. You can install the Android Studio preview side by side with the stable version and work on the same app projects in both. On Mac, these directories are in ~/Library/Preferences/ and ~/Library/Application Support/. On Linux, they're in your home directory. By default, all Android Studio installations share the same Android SDK tools location as specified in the SDK Manager, so updates to your other SDK tools are available in all versions of Android Studio. 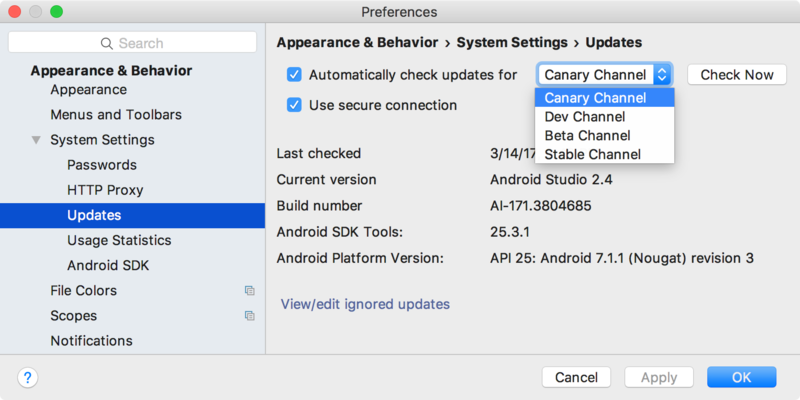 Note: Newer versions of Android Studio might change some configuration data in your projects (such as code style settings in the .idea file), which might not be compatible with the older version of Android Studio. If you don't already have it, download Android Studio stable here. It's good to have just in case you encounter a new bug in the preview version. After you download an Android Studio preview, simply save the application alongside any other version of Android Studio as described below. Rename the resulting folder to something unique like "Android Studio Preview." Move it to a permanent location, such as next to your existing Android Studio install in C:\Program Files\Android\. Inside C:\Program Files\Android\Android Studio Preview\bin\, launch studio64.exe (or if you're on a 32-bit machine, launch studio.exe). To make the preview version available in your Start menu, right-click studio64.exe and click Pin to Start Menu. Note: If you download version 2.3 or lower, the application name does not include the version number, so you must first rename it before moving the new version into your apps directory. Otherwise, you might override your existing version of Android Studio. Drag the app file into your Applications folder. Rename the resulting folder to something unique like "android-studio-preview." Move it to wherever you have your stable version, such as within /usr/local/ for your user profile, or /opt/ for shared users. Open a terminal, navigate into android-studio-preview/bin/ and execute studio.sh. In Android Studio, select File > Settings (or Android Studio > Preference on Mac). In the left pane, select Appearance & Behavior > System Settings > Updates. Be sure that Automatically check for updates is checked, and then select a channel from the drop-down list. When a new version of Android Studio is available for your channel, you'll receive a bubble notification in the IDE. If you chose to ignore it at first, you can check for updates later by clicking Help > Check for Update (or Android Studio > Check for Updates on Mac). For more information about update channels and updating the various SDK tool packages, read Update the IDE and SDK Tools.